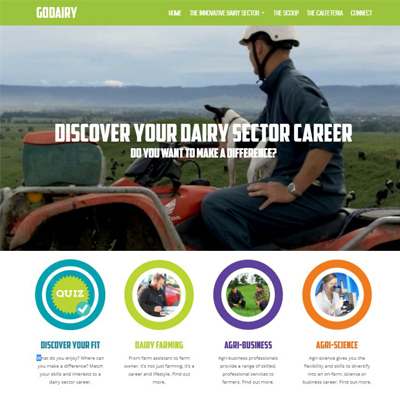 DairyNZ undergraduate scholarships are awarded to outstanding students with a particular interest in dairying undertaking an agriculture or agricultural-related degree at Lincoln, Massey or Waikato Universities. Since 2001, each year bright young Kiwis have the opportunity to apply for their share of more than $300,000 worth of scholarships on offer from the dairy industry. Annual Tuition fees to the value of $6325 are funded for up to 4 years. Recipients are also supported and mentored throughout their time at either Lincoln, Massey or Waikato Universities as well as being given opportunities to network with industry leaders. A DairyNZ scholarship is more than course fees. Scholarship recipients are mentored and supported through university and can expect to gain employment in a variety of positions, either on-farm or in the support areas in dairying. Although New Zealand’s tertiary education fees-free policy means students’ Year 1 course fees may be paid in full, students are encouraged to apply for a DairyNZ scholarship before their first year of study begins to benefit from the mentoring and networking opportunities. A scholarship for Years 2 and 3 can be awarded before Year 1 starts. Applicants need to have NCEA Level 3 or better and be either a New Zealand Citizen or New Zealand Permanent Resident. The scholarship is tenable up to three years and pays the full, formal annual tuition fees - up to a maximum of $6325 per year. Students need to be registered in a full-time course at either Lincoln University, Massey University or The University of Waikato by 31 March in the year of the award and satisfactorily complete course work in each year preceding re-application. Please note: Veterinary Science, Veterinary Technology, Food Science and Food Technology degree programmes are not eligible for DairyNZ Scholarships. Evidence of and/or planned activity to support the New Zealand dairy sector. Evidence of potential leadership skills and/or service to the community or sporting activities etc. Agreement to contribute to the development and promotion of New Zealand dairy sector (such as school promotional visits, career days etc). Academic performance in the previous year of the course for re-application by existing scholars. evidence of your New Zealand citizenship or permanent residency. demonstrating your leadership skills and/or your involvement with community, sports or other activities. * When applying, submit the most current version of your NCEA results and email through Level 3 results when received in January. Applications for the DairyNZ Scholarship Programme open each year on 1 September and close 7 December. Since the scholarship programme started in 2001, the dairy industry has supported over 350 bright and talented young Kiwis in their university studies. Their stories are real examples of how the scholarships have not only helped them financially, but created networking, learning and job opportunities they may not have otherwise had. The DairyNZ scholarship has given me a support network outside of unversity: a group of people who are career focused and forward thinking. See our current scholarship recipients as well as vocational awards, graduates and 5-years-on profiles. The dairy sector needs trained specialists in research and development. DairyNZ helps fulfil this capability need through a range of postgraduate scholarships.